An original letter of correspondence between brothers and business partners Joshua Coffin Chase and Sydney Octavius Chase. 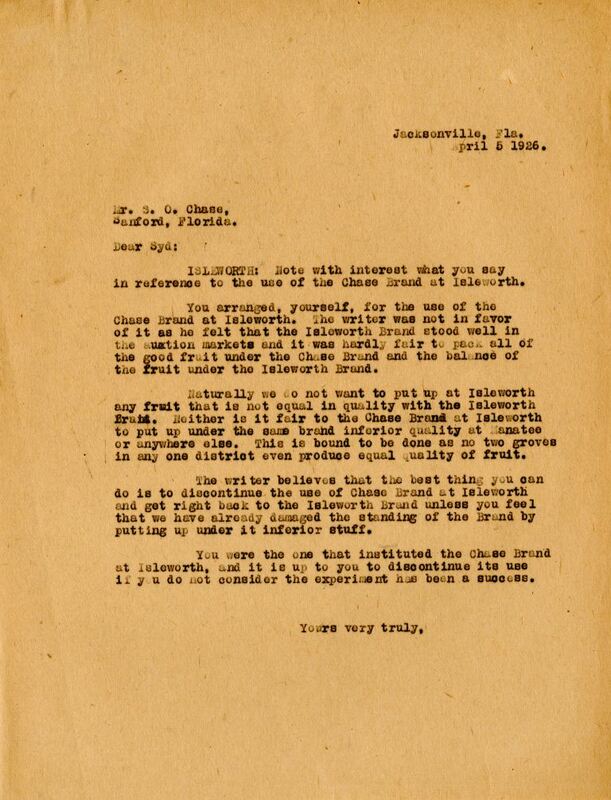 Topics discussed in the letter Joshua's recommendation to discontinue the Chase Brand of citrus in favor of the Isleworth Brand. Original letter from Joshua Coffin Chase to Sydney Octavius Chase, April 5, 1923: box 49, folder 20.84, Chase Collection (MS 14), Special and Area Studies Collections, George A. Smathers Libraries, University of Florida, Gainesville, Florida. Digital reproduction of original letter from Joshua Coffin Chase to Sydney Octavius Chase, April 5, 1923. ISLEWORTH: Note with interest what you say in reference to the use of the Chase Brand at Isleworth. You arranged, yourself, for the use of the Chase Brand at Isleworth. 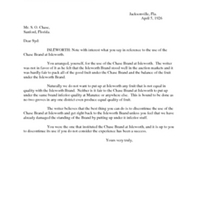 The writer was not in favor of it as he felt that the Isleworth Brand stood well in the auction markets and it was hardly fair to pack all of the good fruit under the Chase Brand and the balance of the fruit under the Isleworth Brand. Naturally we do not want to put up at Isleworth any fruit that is not equal in quality with the Isleworth Brand. Neither is it fair to the Chase Brand at Isleworth to put up under the same brand inferior quality at Manatee or anywhere else. This is bound to be done as no two groves in any one district even produce equal quality of fruit. The writer believes that the best thing you can do is to discontinue the use of the Chase Brand at Isleworth and get right back to the Isleworth Brand unless you feel that we have already damaged the standing of the Brand by putting up under it inferior stuff. You were the one that instituted the Chase Brand at Isleworth, and it is up to you to discontinue its use if you do not consider the experience has been a success. Chase, Joshua Coffin. 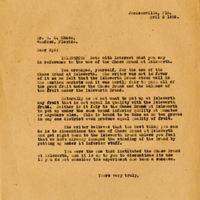 “Letter from Joshua Coffin Chase to Sydney Octavius Chase (April 5, 1923).” RICHES of Central Florida accessed April 19, 2019, https://richesmi.cah.ucf.edu/omeka/items/show/2701.